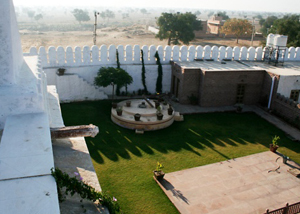 Shri Jasnath Asan(ashram) lies in the heart of western Rajasthan in the village of Panchla Siddha (place of deep meditation) near Khimsar, approximately 100 km from Jodhpur and 60 km from Nagaur. 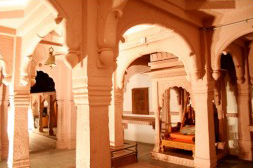 It is one of the oldest asans in the Marwar region. The great saint Shri Boyat ji Maharaj, the direct disciple of Shridev Jasnath ji, founded the asan more than 500 years ago. Many siddhas (saints) performed their sadhana (spiritual practices) here. Thus it is a Siddh Peeth (spiritually enlivened place) highly charged with spiritual energy. These saints spread knowledge and wisdom among the villagers, uplifting their lives, benefiting many people by their yogic power. 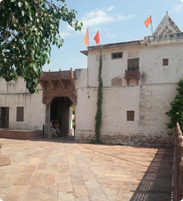 As the fame of Shri Jasnath Asan spread, the then Maharana (king) of Udaipur, Shri Jagat Singh sponsored the construction of the garh (fort like structure) of the asan building. The Maharaja of Jodhpur, Shri Jagat Singh, donated land for cultivation, the grazing of animals, and other environmental purposes. Today, two lush gardens are home to several members of the animal kingdom who greet visitors with joy and eagerness. Shri Jasnath Asan is altogether unique in its architecture and art. It has been lovingly restored and refurnished by its present Adhisthata (head), Yogi Surajnath Siddh, who with utmost devotion has preserved and continues to develop the living heritage of his predecessors. Upon entering the newly constructed outer wall the visitor is immediately attracted by the beauty of the fort like asan structure, its imposing gateway with original metal studded wooden doors. Special certificates, letters engraved on bronze plates and historical papers bear witness to its history and importance. The asan also has in its possession a huge amount of ancient literature related to Tantra yoga and spiritual practices. 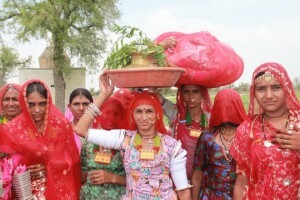 Visitors have the opportunity to experience Rajasthani culture and traditions as well as the simplicity of village life in a very real setting. It is an excellent place to experience nature and stress free living. It is our goal to uplift the quality of human life and we lay great emphasis on establishing humanity, education, health, nonviolence, and morality. Like all large organizations, ours depends on consistent volunteer and salaried labor. Our income is provided from donations large and small. Our expenses include the normal overhead, plus the housing and feeding of our 7 full time employees, who stay with us year round to provide maintenance and programming for local families.